Since undertaking my no meat challenge which has hit the two week mark today, my wife has sought to make meals that are vegetarian. The following recipe was made last night. Bring a large pot of boiled water water to a boil over high heat. 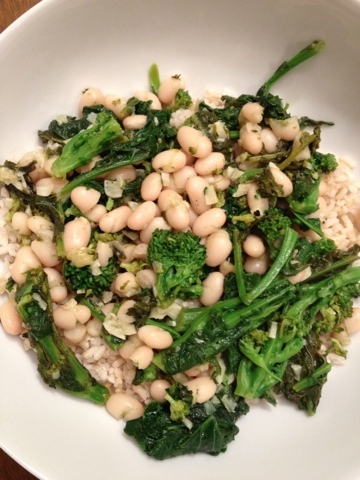 Boil broccoli rabe until just tender, about 3 to 4 minutes, drain and set aside. Place oil and garlic in a large nonstick saute pan; set over low heat. Sweat garlic for approximately 10 minutes, stirring frequently, keeping oil and garlic together in center of pan to avoid browning. Add beans to pan; stir well to combine. Separately,we also made some brown rice to throw into the mix. 3,100 miles. That is roughly the equivalent distance from Los Angeles, California to Portland, Maine or from Boston to Miami, and back. Now, imagine covering that distance on a 883 meter block in Queens, New York and you have the Self Transcendence 3100 mile foot race. Founded in 1997 to exemplify the endless possibilities of the the human spirit by Sri Chimnoy, participants in this adventure have 52 days and must average 60 miles per day to complete the distance. The race course is open for 18 hours per day in order for participants to get their mileage. 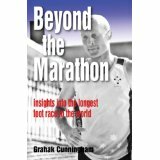 Beyond the Marathon: Insights in the longest foot race in the world, , by four time finisher and 2012 winner Grahak Cunningham explores this event and gives readers an inside take on just what it takes to complete arguably one of the most difficult athletic endeavors on the planet. What I took away from this book is the ability of participants to focus on just the mile and moment they are in. Certainly it is an important skill to have given the duration and distance of the event. Definitely worth checking out as an inspirational read coming off the cold winter base training months and we start sharpening our focus on spring events. Why I certainly didn't think that giving up meat and pop would be an easy endeavor, I was met with some choices right away where I would have to confront those choices sooner than later. Valentine's Day was pretty easy because my wife, who had been a vegan for several years before I met her before giving it up, made me black bean toastado's while sharing chips and salsa with the kids having turkey taco's. Certainly delicious and good fuel for my long run the next day. After my long run of 16 miles the next day, I needed fuel and stopped by Chipotle for a burrito at lunch. While my normal order in the past would be a chicken burrito with white rice, black beans, corn salsa, and a large Diet Coke refilled at least once, this time I went with a veggie burrito, brown rice, black beans and corn salsa. To drink? A Nantucket Nectar Apple Juice. Actually reading the menu, I learned that the Pinto Beans are seasoned with bacon! So far so good. The fifth day so far proved to be the most interesting as I tried several new items. On a lunch date with my daughter before heading out to roller skate (cue the early 90's pop music), we went to Panera's. A normal order in the past would have been to have a chicken noodle soup/baked potato soup and a Sierra Turkey on Asiago bread. This time a wonderful tomato/mozzarella 1/2 sandwich with a cup of vegetarian black bean soup and a water. Later, my wife has somehow procured a babysitter, so we actually had a dinner and movie date. Checking out a new joint called Social Kitchen and Bar, I really had to scan the menu. The waiter had recommended the Chicken and Waffles as well as the Burger, which again probably a week ago, I would have been all over. This time, I settled on an amazingly delicious kale salad with pickled onions, raisins, quinoa, tomatoes, with a red wine vinaigrette and a grilled cheese sandwich on naan bread with a tomato soup dipper. While I munched mindfully taking in the new flavors, it was hard not to hear my wife proclaim that it was the best burger she had ever eaten. That's ok, I felt really good in my choices, because they tasted so good. So here I sit at my local Starbucks trying yet another new item, a soy vanilla latte, and experiencing new tastes on my palette. So far, giving up pop has been relatively easy. It was something that I maybe had a few sips of my wife's on a daily basis and had a can a few days a week. Replacing it has simply been with more water. Meat? Well, it has been much more of a conscious effort heading into meals but so far so good. It has forced me to really read menu's and to try some things that I would have normally skimmed over. One person, has given me the best tip so far as I head down this road and that is to be forgiving. Yesterday began Lent and with a bold declaration I told my wife that I was going no meat and no soda/pop for 40 days, she deftly replied, "You can't just go all willy nilly with no plan, your going to get sick." With my Kindle in hand, she hadn't seen me since Christmas diving into books like Scott Jurek's Eat and Run: My Unlikely Journey into Ultramarathon Greatness nor watching Food Inc, Forks Overs Knives, and Vegucated . As an runner, one of my weakest links has always been my diet. I have swung the pendulum both ways from being healthy and conscious of my eating to gimme that extra slice or two of pizza because I just ran 20 miles. I have always been aware that the better I ate, the better I felt, but have just never made it a priority. Can't change the past, so time to aim my focus forward.Even with meeting several fellow runners who were vegan, I never have stuck to making any meaningful change. Perhaps it has been the perfect storm of my increased yoga practice and delving into the books and movies that my interested has been renewed and given my purpose to my eating over the last month. My yoga practice has given me a better awareness of my body as it slowly works to unwind itself. While I have been in no ways perfect, one of the highlights that I learned from Jurek's book was that his transition to veganism was a slow one. In order to make a systemic change that will last, you need to incremently make changes in order for them to take effect. Henceforth, I decided during this period of Lent due to my religous practice to give up meat and soda/pop. Forgoing soda/pop for me should be an easy one. I am not one much for the bubbly concotion, but I am not gonna lie that a Coke or a Root Beer doesn't satisfy the palatte every once in awhile. Going no meat though should prove to be a challenge. On average, I would say that I have meat 3-5 times a week at lunch or dinner and in various forms. I know from my initial reasearch that we do not need as much protein as we believe and that you can get in many forms via a whole food or plant based diet. Putting it out there for public record should also help to strengthen my resolve and accountability. Saying it only to yourself makes it far easier to quit when no one knows your really making any changes. So here we go. One day down so far and 39 to go. It's like having a newborn all over again. Late nights of howling and cleaning up pee and poop, but I wouldn't have it any other way. Dash has been home for just over a week now and everyone is adjusting to a new schedule. He isn't Nemo where we could just leave him be. Nope, you have to keep a close eye on this one as he is exploring his new world and wants to put his teeth on everything to figure out just what it is. In some instances, it is the most responsible I have seen the kids. They are making sure he is going out on a regular basis, has adequate food and water, and making sure he gets his play in. My son fancies himself the "trainer" and is eagerly anticipating "puppy school". Me? 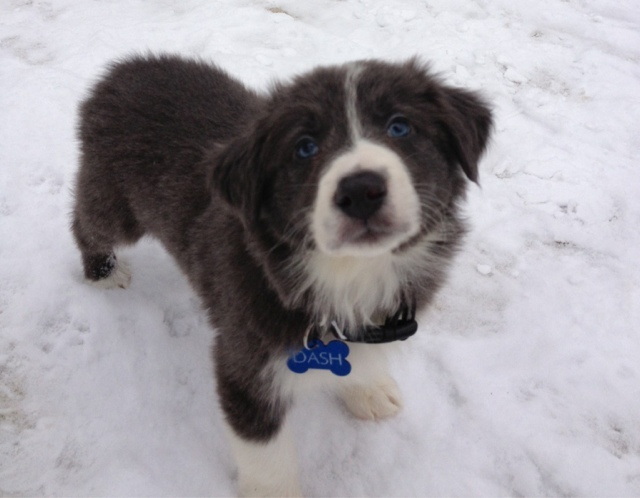 I'm chomping on the bit for him to grow up, not to fast mind you to get those early morning runs Dash on my friends.